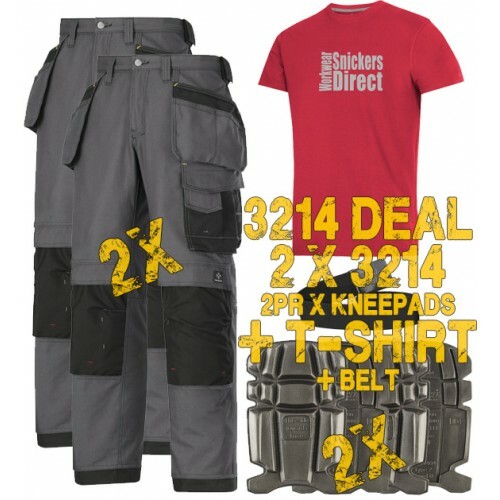 The Snickers 3214 are amazing work trousers made in Canvas+™ fabric. They feature an advanced cut with Twisted Leg™ design making them exceptionally comfortable, Cordura reinforcements for extra durability and Velcro tool fasteners. Plus, a range of pockets, including holster pockets and phone compartment. Two easily accessible holster pockets with outside compartments and wide openings making handling tool easier. Canvas+™. An extremely comfortable, rugged fabric. 60% Cotton, 40% Polyester, 340/m2. Featuring 100% Cordura®-Polyamide reinforcements.